Traders are excited about driverless cars. They see a tremendous investment opportunity. Driverless cars, also referred to as autonomous vehicles, are designed to sense their environment and navigate roads without human input. Autonomous vehicles rely on technologies like GPS and radar to study their surroundings and make intelligent decisions about the car’s direction and speed. Depending on how soon the vehicles are introduced and adopted, the implications for investors are potentially large. Automated vehicles are quickly nearing a level of maturity that will allow manufacturers to start deliveries to consumers. A large group of companies are actively developing complete automated driving systems and the components that go into those systems. This list includes traditional auto companies, suppliers, non-automotive technology companies, and startups. Several of these companies entered this market recently but rapidly moved into contention through acquisitions, investments, and strategic hiring of key personnel. 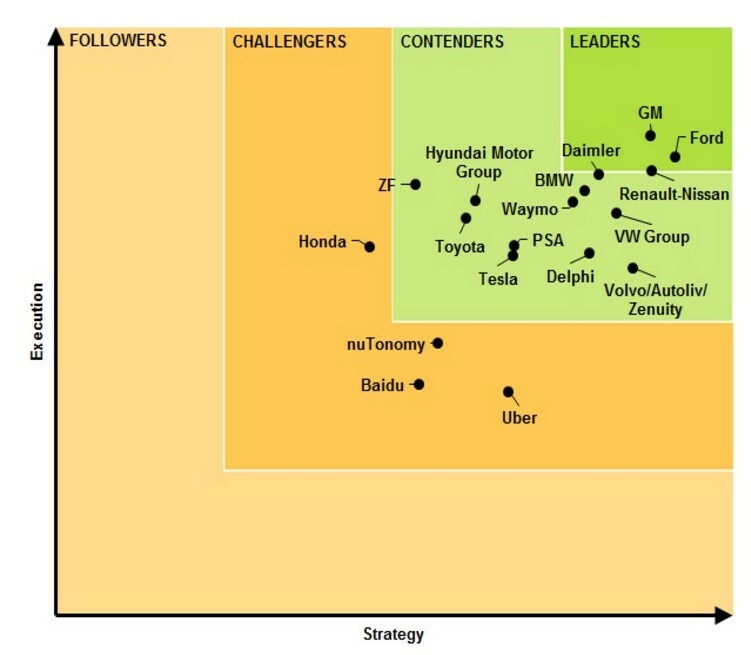 Navigant Research believes the traditional automakers have an edge in the market. Other companies are working on the technology with little attention. Some experts believe large trucks that operate mainly on highways are likely to be an easier environment to develop autonomous driving technologies. There are economic reasons to pursue this technology, as well. There is a growing shortage of professional truck drivers, and as many as 900,000 new ones will be needed as current drivers retire. Safety regulations only permit drivers to operate their vehicles a certain number of hours per day before they have to take mandated rest periods. There’s already been a proof of concept that driverless trucks could be useful. Last October, Otto, a startup Uber owns, used an autonomous truck to complete a 120-mile drive in Colorado. The trip was for Anheuser-Busch, a company whose trucks travel 450 million miles a year on US roads. Now, the US trucking trade group American Trucking Associations along with truck maker Navistar International Corporation (NYSE: NAV) is urging a US Senate panel to include autonomous commercial trucks in proposed legislation that would expedite self-driving vehicles to market. Last week, the House unanimously approved a bill to speed up the adoption of autonomous vehicles and restrict states from limiting their use. But the bill only applied to cars under 10,000 pounds, and the Senate is now contemplating whether to add larger commercial trucks to the legislation. This could spark interest among traders in truck makers. Navistar offers one of the world’s premier and most trusted truck brands. International Truck offers state-of-the-art performance and solutions for a variety of global markets. The brand is supported by the industry’s largest dealer network and offers a complete lineup of integrated vehicles. The company recently reported earnings that beat analysts’ expectations and the stock rallied. This was the first time in four quarters the company beat expectations. On average, Navistar has been among the most disappointing stocks when it comes to meeting estimates. The company missed estimates by an average of 590% in the past five years, a record showing management is not communicating well with analysts. But, the stock chart indicates that traders may need to see proof that the company can deliver. After the recent rally, the stock is near an important resistance level. Resistance is a price level where an up trend is likely to stall because of increased supply of the stock. Resistance levels are often located near old highs that mark the upper limit of a price pattern. The vertical line in the chart above shows highs from 2013 and 2014 are now marking resistance. Investors who bought at that level may sell, now that they are back to breakeven. Facing resistance, NAV is likely to fall into a relatively narrow trading range. 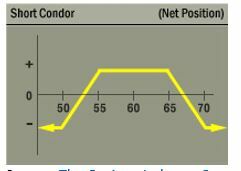 One option strategy that benefits from a stock in a trading range is an iron condor. This strategy has the added benefit of carrying limited risk. As you see, all of the options expire on the same day. The difference in the exercise prices of the calls or puts is equal to $2. Since each contract covers 100 shares of stock, this means the maximum risk on the trade is equal to $200 less the premium received when the trade was opened. Selling the options will generate $1.30 in income ($0.75 from the call and $0.55 from the put). Buying the options will cost $0.70 ($0.45 for the call and $0.25 for the put). This means opening the trade will result in a credit of $0.60, or $60 for each contract since each contract covers 100 shares. The maximum risk on the trade is equal to the difference in strike prices ($2) minus the premium received ($0.60). This is equal to $1.40, or $140 since each contract covers 100 shares. Most brokers will require a margin deposit equal to the amount of risk. That means this trade may require just $140 in capital. The potential reward on the trade ($60) is 42% of the amount risked, a high potential return on investment. The trade will be open for about a month. If a trade like this is entered every month, a small trader could quickly increase the amount of capital in their trading account.